The Agilent 34401A has become the worldwide de-facto standard of excellence in the 6.5 digit DMM market – with unequaled measurement performance and reliability. It has also been out on the market for more than 15 years. 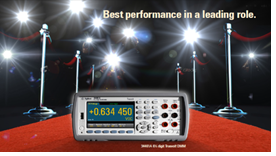 Today Agilent announced the new Truevolt series of digital multimeters that include the 34461A and 34460A. The 34461A is designed to be a drop in replacement of the 34401A. The 34460A offers a basic entry point into the 6 ½ digit class of Agilent DMMs. The very first thing you are likely to notice with these new DMMs is the large, bright, high-resolution color graphical display. This display enables many of the new features you will enjoy: graphical views (histogram, trend chart, bar meter) of your measurement results, easy navigation through measurement set-up options, or preferences that can be configured and pulled up automatically at the next instrument start-up. I personally feel that the new histogram and trendchart/datalogging display modes will save me a bunch of time. Coupled with the in-box statistics, I can now view and analyze my data without doing any programming and visually see my measurements. The trendchart mode is like a crude digitizer, I've been able to check if my signal is drifting or if there is a glitch in the signal. 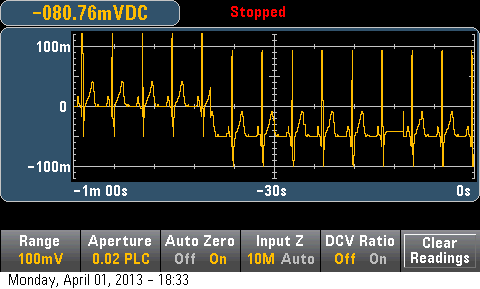 Histogram mode has allowed me to determine if my signals are noisy or if they have a Gaussian distribution. With the large 10,000 reading memory, I can export the data on the fly if I need to do any further analysis on the PC. Through the display and intuitive, menu-driven interface, you can easily save and document all your DMM results. First, pick your I/O of choice – USB, LAN or GPIB, or easily access your data from the front-panel USB connection. You can also easily access the files on your DMM using drag-and-drop file access to transfer files from your DMM to your PC directly – no software required! 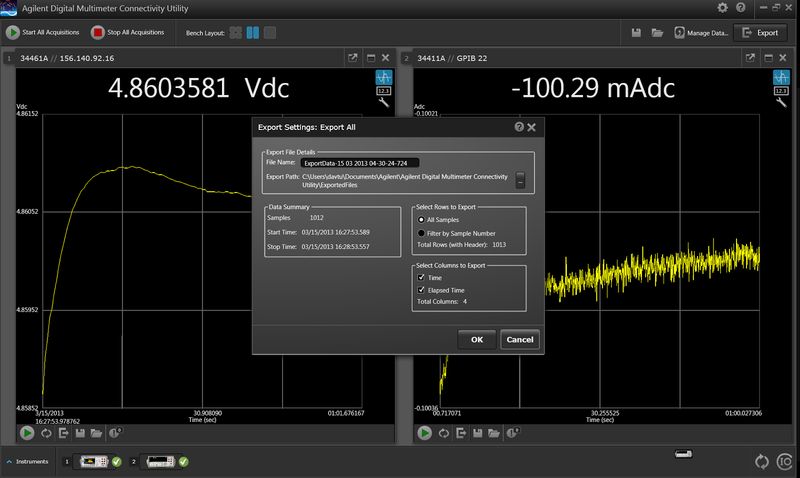 Finally, we have new DMM Connectivity Utility software that allows you to control, capture and view your DMM’s data on your PC or mobile device. This free utility from Agilent will not only support the new Truevolt DMMs, but many of the older Agilent DMMs including the 34401A, 34410A, 34411A and the new 34450A. It has the ability to log data, visualize it, and export to Word/Excel/Matlab. 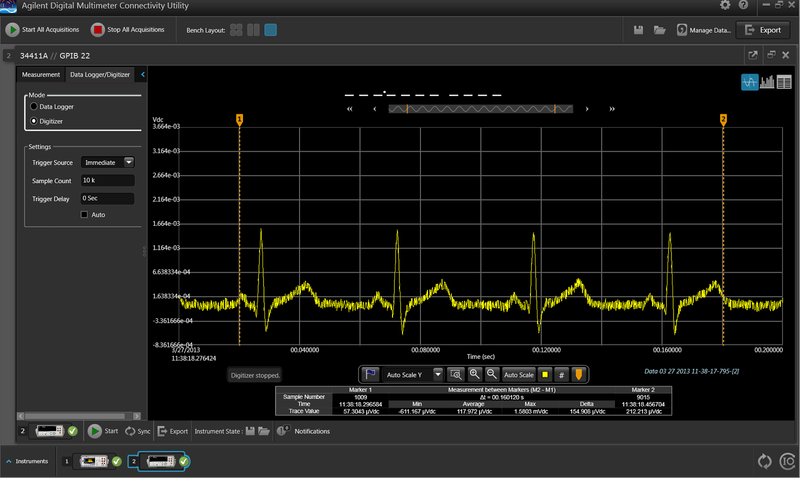 In addition, you can simultaneously control, analyze, and measure with multiple DMMs. What is Truevolt confidence? Truevolt is all about the trust, confidence, long-term guarantee and stability of Agilent DMM measurements. It is comprised of three elements. The first is our patented analog to digital converter architecture. Only Agilent DMMs offer direct digital sampling for AC measurements – this ultimately allows for crest factors up to 10 without additional error terms (other 6½ digit DMMs will likely have a 5:1 crest factor rating). The second element is around noise – eliminating all the extraneous noise from the instrument and environment that can affect your measurements. 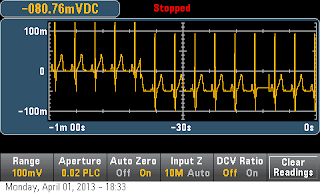 Agilent’s Truevolt DMMs have the lowest injected noise and input bias current of all 6½ digit DMMs. Finally, Truevolt is derived, compliant and guaranteed specifications according to ISO/IEC 17025 methodology, as well as new safety and regulatory standards. These have changed a lot in the past 20 years. The new Truevolt family is the first DMM to be compliant with the latest industry safety standards that require even more rigorous abuse testing and safety margins that will go in effect in late 2013. Agilent’s specifications are not just numbers on a piece of paper. Using ISO 17025 methodology for documenting and communicating the performance of our DMMs means the specifications are valid for a whole variety of environmental conditions – shake, shock, vibration, EMI/RFI, temperature, humidity. Numbers may look the same on a piece of paper as you compare different DMM solutions, but Truevolt and Agilent DMMs will show a vast performance difference in the level of conformance and repeatability of the instrument. Now, move to the next generation 34401A with 100% assurance. The 34461A was designed intentionally, by many of the same engineers that designed the 34401A, to be the 34401A replacement. The 34401A is used in thousands of test systems all over the world and being a drop-in replacement is critical. With the Truevolt family and the 34401A, Agilent is the original designer and manufacturer. We have our own source code as reference so that we can migrate that into the design systems for the software development of the Truevolt family. While much of the 34401A syntax is documented, there are other firmware paths that are accepted that are not documented, that only the Agilent design team knows. That is all carried forward and maintained in the Truevolt program code syntax execution. Only Agilent can provide this advantage in a 34401A replacement – it is not an emulation mode, it is native and intrinsic to the design. Here is a video highlighting many of the feature of the Truevolt DMMs. A nice easter egg from the video shows a picture of the development team. It shows a few younger faces but a lot of veteran engineers that have been around the block. It highlights the maturity and dedication that Agilent has in the company. These DMMs should reflect the quality that HP/Agilent has shown throughout the years.